It is also simple to say, and the most convenient time so that all the family might be present is in the evening, probably right after supper. Each member could alternate in leading the prayers. 1. First the Apostles Creed is said while holding the crucifix. The leader would say: "I believe in God," then all would join in the Creed. 2. The leader would then say the first half of the Our Father on the large bead and the first part of the Hail Mary on the three small beads followed by the Glory be to the Father, while the others recite the second parts of these prayers. 3. The leader then announces: The Five Joyful (or Sorrowful, or Glorious) Mysteries and the name of the First Mystery. 4. 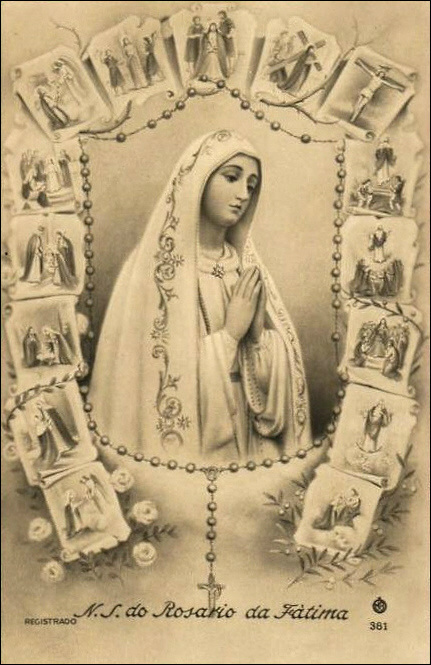 Then in order, the Our Father is said on each large bead and the Hail Mary on the small beads as above, with the Glory be at the end of each ten Hail Mary's. 5. Concluding the last decade with the Hail Holy Queen. Hail, holy queen, mother of mercy, our life, our sweetness, and our hope! To thee do we cry, poor banished children of Eve, to thee do we send up our sighs, mourning and weeping in this valley of tears. Turn then, most gracious advocate, thine eyes of mercy toward us; and after this our exile show unto us the blessed fruit of thy womb, Jesus. O clement, O loving, O sweet Virgin Mary! O God! Whose only-begotten Son, by His life, death, and resurrection, has purchased for us the reward of eternal life; grant, we beseech Thee, that, meditating upon these mysteries of the Most Holy Rosary of the Blessed Virgin Mary, we may imitate what they contain and obtain what they promise. Through the same Christ our Lord. Amen. May the divine assistance remain always with us. Amen. And may the souls of the faithful departed, through the mercy of God, rest in peace. Amen. Holy Virgin, with thy loving Child, thy blessing give to us this day (night). I believe in God, the Father Almighty, Creator of heaven and earth; and in Jesus Christ, His only Son, our Lord: Who was conceived by the Holy Ghost, born of the Virgin Mary, suffered under Pontius Pilate, was crucified, died, and was buried. He descended into hell: the third day He arose again from the dead; He ascended into heaven, sitteth at the right hand of God, the Father Almighty; from thence He shall come to judge the living and the dead. I believe in the Holy Ghost, the holy Catholic Church, the communion of saints, the forgiveness of sins, the resurrection of the body, and life everlasting. Amen. Our Father, Who art in heaven, hallowed be Thy name. Thy kingdom come; Thy will be done on earth, as it is in heaven. Give this day our daily bread; and forgive us our trespasses, as we forgive those who trespass against us. And lead us not into temptation; but deliver us from evil. Amen. Glory be to the Father, and to the Son, and to the Holy Ghost. As it was in the beginning is now, and ever shall be, world without end. Amen. 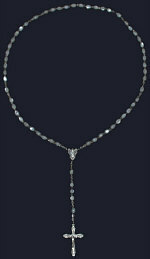 THE FATIMA ASPIRATION (O my Jesus) O my Jesus, forgive us our sins! Deliver us from the fires of hell! Have pity on the souls in purgatory, especially the most abandoned.